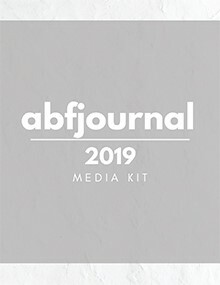 In 2019, ABF Journal will continue to provide readers, online visitors, on-the-go executives and advertisers with multimedia platform options. ABF Journal’s leadership position in the asset-based and specialty lending industry is derived from its long-standing reputation for consistent delivery of quality content, a hallmark of the publication since its launch in 2001. As reader habits have changed, so too has ABF Journal, with a broader array of content delivery options encompassing print, digital, online, email, mobile and social media choices. ABF Journal continues to lead all others by offering integrated marketing solutions that deliver maximum results. Well into ABF Journal’s second decade of publication, we’re reminded of one of the basic tenets of this business that will continue to guide us into the future — never stray from the unrelenting passion for providing quality content that got us here. The method of delivery doesn’t matter if we lose sight of this underlying imperative. Click to download the ABF Journal Media Planner. We recently expanded our delivery platforms to encompass new channels of distribution, while being mindful of how convenience is playing a role in satisfying the informational needs of readers. Advertisers benefit from this shift as it creates a broader array of venues that can be used to promote a product or service. Marketing campaigns are most effective when considered in the context of multimedia campaigns that broaden the reach of your messaging strategies. Since our early 2014 refresh of the abfjournal website, our advertisers have enjoyed the benefit of a year-over-year growth of 50% in unique visitor counts. Planned for launch in early 2017, our new upgraded website will feature user friendly, adaptive technology to ensure higher visitor counts and longer time on site visits that will translate into more attractive ROI for our advertisers. What matters most is the ABF Journal’s access to the headline makers and thought leaders in this vibrant industry. Our expanded editorial staff is on-point, working directly with the folks who can bring unique perspectives to the topics that are top-of-mind for our readers and online visitors. ABF Journal delivers a series of articles and feature stories authored by regular contributors and industry practitioners, including exclusive interviews with many of the recognized leaders in the ABL industry. If you’re seeking to broaden awareness of your brand or support a specific campaign, ABF Journal and abjournal.com are where you need to be to ensure you get the ROI you’re seeking. 81% (4,433) of ABF Journal subscribers hold the title of VP or above — 46% (2,548) are senior or top-level executives. 62% (3,402) of ABF Journal subscribers are employed by asset-based lenders — bank and non-bank financials, smaller independents and factors. 27% (1,482) are comprised of lender referral sources, i.e., law firms, accounting firms, turnaround management and consulting firms and private equity firms. Now entering its 18th year in publication, ABF Journal publishes seven issues annually including special editions themed around specialty lending, bankruptcy, borrowers and turnaround management. ABF Journal’s digital edition and mobile apps provide extended reach for anytime, anywhere delivery of our exclusive news and print content. ABF Journal offers a national circulation base of 5,500 subscribers — 2,700 of whom also receive the digital edition. Maximize reach with multiple media channel distribution — print, digital, online, daily & weekly e-news broadcast, & mobile app. ABF Journal’s companion website features daily-news updates, transaction activity with lender/borrower details, topical articles authored by industry practitioners and relevant commentary from thought leaders on everything asset-based, specialty lending, turnaround and legal related. With over 16,000 unique visitors each month, advertisers continue to enjoy the benefit of 50% growth in unique visitor activity since our last refresh in 2014. Online advertisers benefit from rotation limits that ensure a minimum number of page impressions through the duration of a contract. Monthly metrics are provided to ensure campaign performance levels are in tune with your expectations. The ABL industry’s most popular email platform, ABF Journal’s Daily E-News broadcast reaches the inboxes of more than 6,000 subscribers every business day, delivering current information and daily commentary on the top news stories shaping the industry. E-News sponsors enjoy consistent branding and visibility to an opt-in audience of professionals within the ABL market demographic. The ABF Journal’s Weekly Wrap-Up — driven by reader popularity — features the top 10 stories from the previous week and provides a unique advertising opportunity that is limited to just three advertisers ensuring maximum exposure. Our email broadcasts are supported by a robust delivery system that consistently provides delivery rates of 99% or better. This budget-sensitive platform provides the benefit of having your own webpage resident on the abfjournal.com. This page can be used to promote your unique expertise and experience to deliver solutions to deliver solutions to a nationwide audience of asset-based lenders and specialty finance companies. For added value, become a Featured Partner and watch your logo on the abfjournal’s homepage drive incremental traffic to your directory page. Directory advertisers also gain additional visibility by being listed on our print and digital magazine index pages throughout the duration of a contract. If it’s a value proposition you want, that’s what you’ll get when you make the smart decision to establish a presence on the abfjournal’s services directory pages. ABF Journal and abfjournal.com offer both print and online classified employment advertising packages. Classified employment advertising with ABF Journal magazine and online with abfjournal.com produces unequaled results, and is the most cost-effective hiring solution in the asset-based lending and factoring industries.